You need the hardest-working, best-trained professionals in the merchandising industry. Anderson Merchandisers is that team. The success of Anderson Merchandisers is a direct reflection of the dedication and expertise of our associates. Nobody knows how to navigate a retailer like our people. 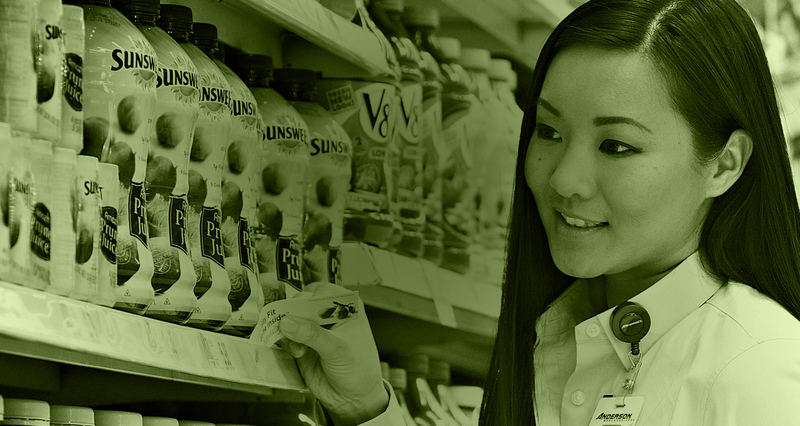 No other merchandiser spends more time in stores than our people. Nobody knows how to enhance the shopping experience better than our people. And nobody knows how to position our clients’ brands to succeed better than our people. This is no accident. People are what make the difference for Anderson Merchandisers. To make certain we have a world-class team, we follow extensive screening practices before hiring each individual, and then we engage each person with training and support from day one. Our A+ Certification process ensures that every Anderson associate has the knowledge they need to drive your product sales. They build close working relationships with store personnel and many times serve as extensions of the stores themselves. And they practice the values that have made Anderson successful since its establishment nearly a century ago. Equipped with industry-leading technology, our people ensure that clients always have a real-time view of their products in every retailer where we work. In short, nobody works more efficiently or effectively. Nobody.